There are two big, competing issues for the outlook in this case, which is something we routinely discuss with our revenue advisory committee. On one hand is the fundamental growth in underlying asset prices (home, equities, etc.) couple with an aging population. This strongly suggest estate tax revenues will grow briskly over the coming decade or two. However on the other hand, our advisors point that accountants and estate planners are much better today at planning and managing around these life events, inheritances and the like. From this view, expectations are that revenues will be relatively constant moving forward, or show little growth. This is not because estates are less valuable and not because people are not paying taxes, but because households are better able to manage the tax implications of larger estates. 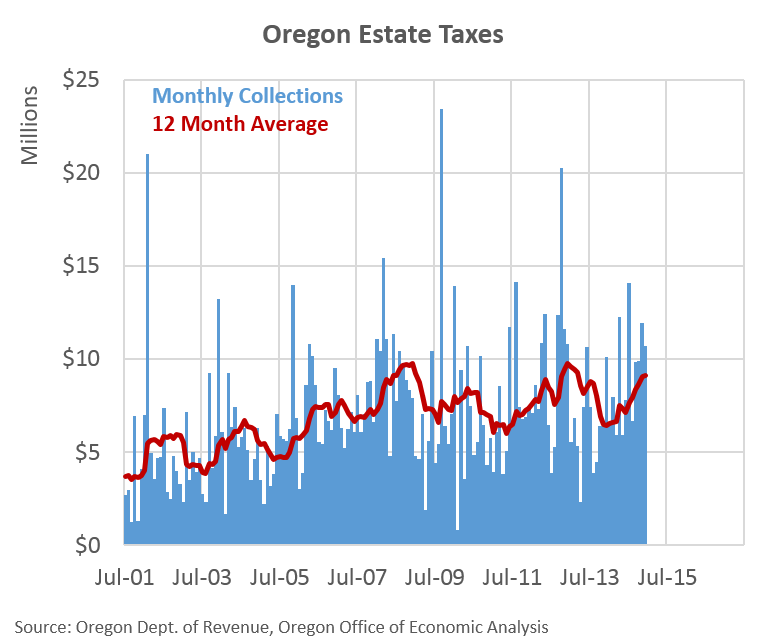 For the record, our office has a moderate growth outlook for estate tax collections moving forward, which reflects both of these competing trends.